Steenwijk is located at the head of Overijssel. On the wet westside this picturesque town borders on the water region of Giethoorn and the Weerribben. On the dry eastside you will find the nature areas De Woldberg and De Eese. In this area of 1500 ha. you will see forests, heaths, fields, charming farmhouses and a small castle. You will find two cottages in this fabulous region: De Arendshorst en De Valkenhorst. 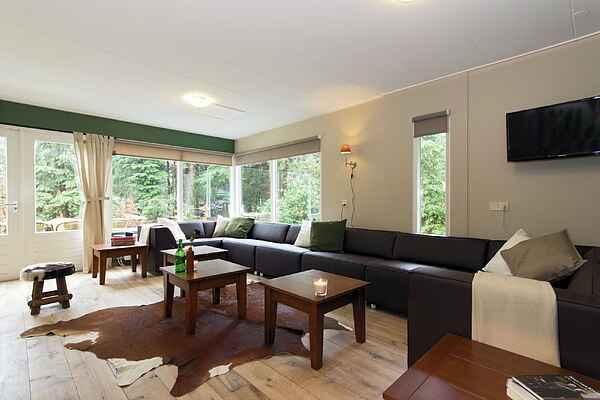 De Arendhorst is a cosy house with 2 floors, equipped for 16 persons. There are three bathrooms, one at the upper floor and two downstairs. In the middle of the room there is a cosy open fire. Of course there is enough seating room both in the dining- and the living area. 'As of 1st January reservations for our Group holiday accomodations will belong to a different set of booking conditions. Please inquire further by our reservations department.